A natural extension of the locavore movement, canning is considered trendy and like all trends has benefited hugely from social media. Send out a tweet or post a notice on Facebook about organizing a canning party and you are likely to get a big crowd together in no time. Canning communities are springing up everywhere—both on the internet and in home or community kitchens. As Sarah Hood, a longtime Canadian jammer and food writer points out in We Sure Can! there are as many types of people who are interested in canning as there are reasons to can: the thrift conscious, the crafty DIYer, the foodie the culinary historian, the gardener, the person who wants to live off the grid, the urban forager, the locavore, and even the citizen of the world. Whatever type of person you are, We Sure Can! offers a bounty of inspiration, instruction, and recipes for both experienced and novice canners alike. It is well researched, easy to follow and beautifully photographed. Ms. Hood set out not just to explain the method of hot water bath canning, but to compile an eclectic mix of recipes for jams, jellies and pickled food that is organized by season. This is a book that is meant to take you through a whole year of canning fun (if that’s your thing). The recipes she has compiled come from canners all across North America and the U.K. and run the gambit from simple fare, like Apricot Jam Five Ways or Tomato Sauce to exotic, like Watermelon Jelly with Thai Sweet Basil Ribbons or Indian-Spiced Zucchini Pickle. With the stage now set for your own canning project, next comes the instruction on how to go about it. If you are a first-time canner, it is really important to read Ms. Hood’s instructions more than once so that you have a good understanding of the process and reason for doing things before you begin. Canning is more like a science experiment than regular cooking, but it need not be overwhelming. While it is very important to follow the rules in order to process food safely, “on the whole,” Ms. Hood writes, “learning to can should be no scarier than learning to swim or change a light bulb”. Of course the real test of any cookbook is whether or not a novice can easily follow the instruction without the benefit of someone more experienced by your side. Happily, Ms. Hood does not disappoint. 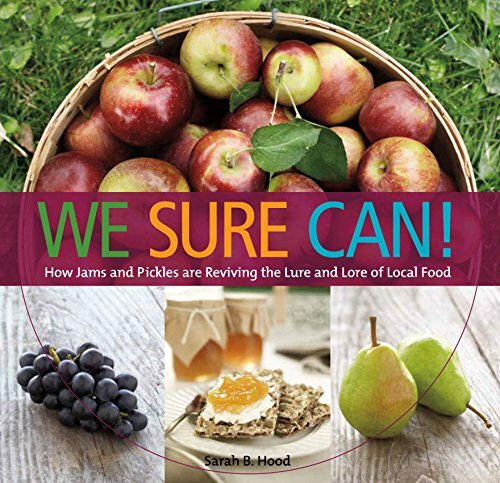 Everything you need to know to successfully make jams, jellies, and pickles can be found in We Sure Can!—right down to listening for the ping of a lid that has properly sealed once you take it out of the hot water processing bath. That said, if you have never done this before, fair warning, it is a big time commitment. Ms. Hood says beginners should expect a small canning project (and she does suggest doing things in small batches) to take up to four hours (I did mine in about three). This is slow food taken to the extreme and you really have to carve a big chunk of time out of your day without interruptions to do it. Once started, the process has to keep moving—the jams or jellies need constant attention on the stove, and once done cannot be left to cool before filling the jars. Nevertheless, for all the effort, the finished product is quite satisfying. Like the pains of childbirth that are quickly forgotten, all the cursing and sweating over a hot stove is but a fleeting memory once you hold up a homey jar of jelly or jam made with your own two hands. Come winter, that jar of watermelon jelly with thai basil will surely bring you a welcome taste of summer. And that, in essence, is what the fuss is all about—making the bounty of summer last. For novices and experienced canners alike, We Sure Can! offers plenty of ways to enjoy the harvest year round and is an important resource for the ever-growing ranks of home canners.